Unstoppable Hum 2 uses the barely audible sound generated by electricity emitted from products like lights, computers, refrigerators, etc. (called electro-mechanic activity), in addition to the constant humming of the human body (syncopated and erratic life sounds), and turns the vibrations into music. There are two robots on a wall that perceive this low and ever present energy. 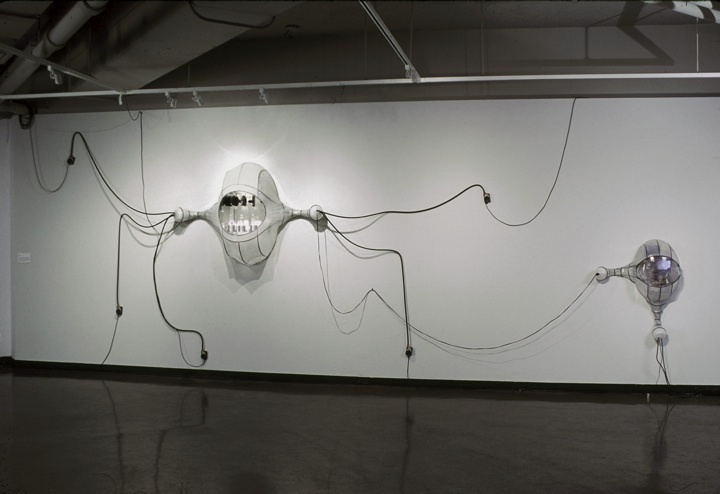 The first robot’s job is to 'listen' via contact microphones, which detect the electromagnetic activity in the gallery space, and depending on how the microprocessors respond, the robot translates the signals and blows air over glass bottles of water in varying notes to essentially compose music. The second robot utilizes a geophone to detect human movements and sounds, microprocessors translate the information into digital signals, and the bot generates sounsd by pushing water through a tube. The first robot is louder, and meant to demonstrate all of the non-human activity, while the second acts as though the building itself were responding to the people within it. Together, they are a comment on the relationship shifts between humans and technology, and the ever-growing prevalence of electricity in modern cultures.